Full page image backgrounds: slideshows or still images. Animated page menu and page loading. Optional staff, food menu, and services sections. Tailor the site to your business. Sell products using the WooCommerce or Jigoshop plugins. Easy to use options you’ll actually want to use (no fluff). Style editor to add your own color scheme. Enhanced WordPress image gallery with lightbox. Custom widgets for business hours/contact information and video. Optional social media links for 15 social networks. Cross browser tested in Chrome, Firefox, Safari, Opera and Internet Explorer 8+. Responsive design so your site will look great on tablets and smartphones. Quality support you can count on. updatedwidget-contact.php - Made phone number clickable to open phone app in mobile and an application on desktop. Made address clickable, which takes you to Google Maps. newoptions.php -- added option for header text. - changed footer text from simple text to "editor" input. updatedstyle.css -- removed: -webkit-font-smoothing:antialiased; font-smoothing:antialiased; text-rendering:optimizeLegibility; from the body styles. updatedincludes/custom-js.php -- changed single image to display full size background image. updatedNewsletter.php replaced "Join" with call to newsletter_button option. newWord-break to Style.css for widgets to help with long email addresses. updatedChanged get_stylesheet_directory_uri to get_template_directory_uri in custom post types to make dashboard icons visible in child themes. updatedChanged meta boxes to the Custom Fields and Meta Boxes used in other themes (standardizes fields). 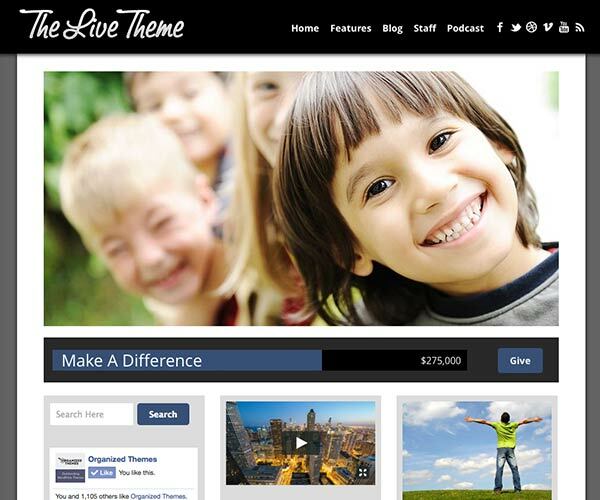 newHeader social links to Pinterest, Google Plus, Flickr, Picasa, and Dribbble. Updated all header icons. updatedRemoved logo from the header and placed it in a separate div to allow for easier logo and site spacing. newBackground uploader for smartphone sized screens. 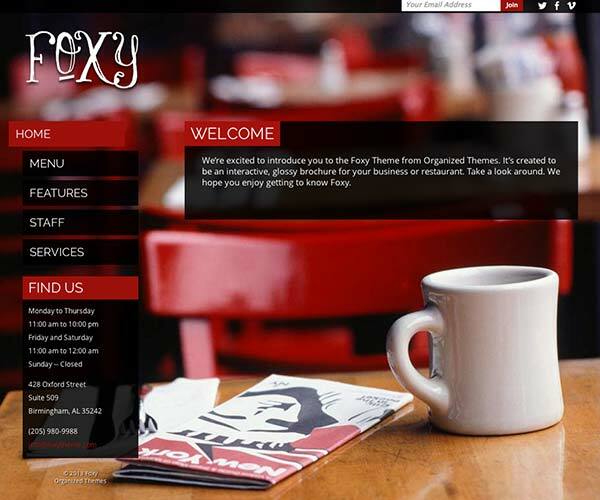 updatedcustom-js.php -- changed fit_portrait to "1"
Foxy is a unique WordPress theme that’s perfect for fashion sites, businesses, or restaurants who want to impact their visitors with big, bold images. Immediately the full-size background images catch your attention and pull you into the site. The backgrounds are easy to customize and can be a slideshow (with 7 transition effects), a specific image, or a random image with every page load. 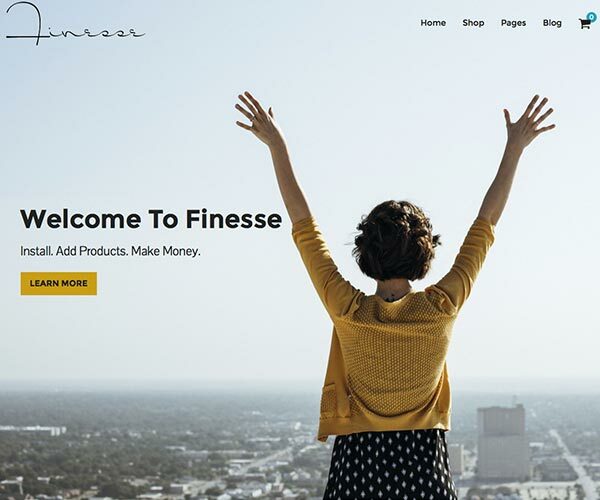 The theme also has built in support for the Jigoshop and WooCommerce e-commerce plugins.